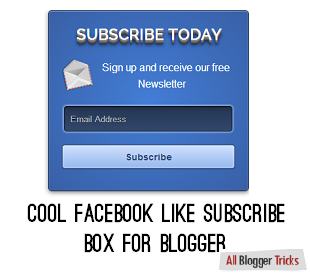 Hello fellow reader today I am going to tell you how you can add Cool Facebook Like Subscribe Box to your Blogger blog.Subscribe Box is a very important widget for blogs who want their visitors to return. This box which is replica of the Facebook Login box converted to Subscribe box by Your PC Genie can fetch you lot of subscribers. The prerequisite of this template will be an account made at Feedburner where subscribe by email is enabled. This widget has an elegant look and is very beautifully coded. The bar and button glow when they are active (mouse is pressed on them). A live working demo of this widget can be seen by clicking the button below. Once you have seen the demo to add this widget to your blog follow the below step.